I was asked to provide some finger food for a friend’s birthday party. I agreed to do a number of savoury dishes. Most of my friends and I are what is often referred to as hippies. I hate this term, not jut because it is usually levelled at us as a pejorative, but also because I like to think that my views are a more modern take on the environmental and peaceful aims that a lot of hippies espoused in the 60s. One thing I guess we do have in common is a reluctance, or downright refusal to eat other animals. Many of my friends are vegetarian, including the birthday girl. So I made a whole range of veggie finger foods for the occasion. Here are a few selected highlights.I even managed to make some of these vegan! This one starts with a confession. This was originally a Delia Smith recipe. I am not a massive fan of the patron saint of the British home cook, if I am honest. This opinion may get me strung up from the nearest pasta tree, but there, I have said it. I know she has done many good things to improve cookery skills and so on, but I find most of her recipes a little staid. Then there was the infamous bean incident that we no longer discuss, but let’s just say that her (rubbish) cheat for beans left a party of hungry walkers without a stew for several hours too long, and left me beside myself with embarrassment. Luckily, I think they all got a little merry and didn’t notice exactly how late their dinner was. All that said, this recipe will blow your socks off. The basic premise is that this is a bloody mary in solid form, which saves on washing up of all those pesky glasses. Firstly, mix the ingredients for a bloody mary. The following figures are really rough, and you should mix it to your taste anyway. If you are particularly keen on other things when you make a bloody mary (eg I did know someone who insisted on adding some English Mustard Powder) then add that too. Why not? Give it a good whisk to blend the ingredients as well as you can. 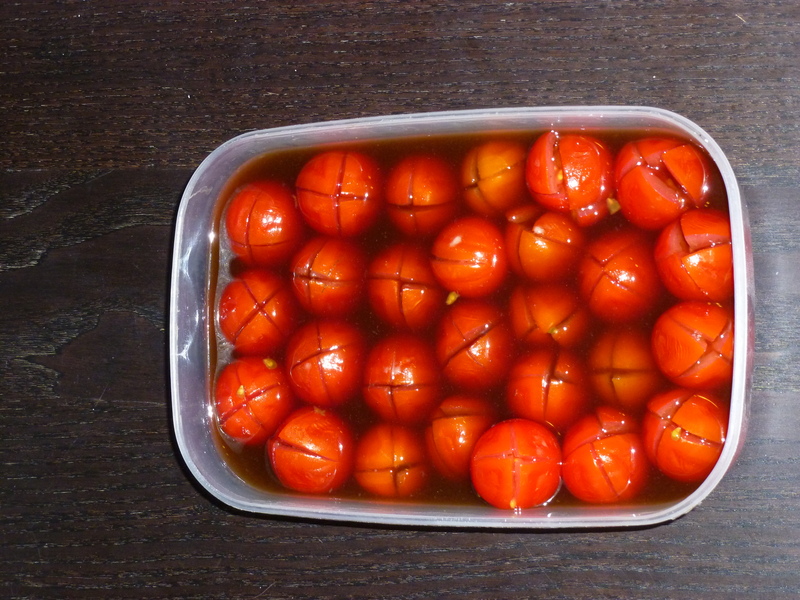 Cut crosses in the bases of a load of cherry or baby plum tomatoes. A mix of red and yellow is also attractive. Place these quite snugly in an airtight container, with the cross facing upwards. Pour the bloody mary mix over the tomatoes. Seal the container, and marinate in the fridge for as long as you can. Two days is ideal, but I often forget that they should have this long, so often only do one.I also forgot a second bowl in the fridge at a party, and the booze kept them good for a couple of weeks. Drain them, then arrange on a plate to serve. You can keep the vodka mixture for another batch if you like. These are really popular, and will go quickly. It will be up to you what excuse you use to make sure any kids at the party eat the undoctored tomatoes, and not these. 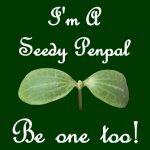 I found this recipe over at raspberry eggplant. I wasn’t able to find ginger soy sauce, so I made my own by using dark soy, and lump of garlic about 2cm thick, which I then grated into the soy. This does the trick, and imparts a lovely flavour to the tofu, but it does leave it much blacker than the ones that Roopa has photographed over there.I have tried water down the soy, but that does not seem to make much difference. Nevertheless, they went like hot cakes, despite being cold skewers. Well, I don’t want to bore you with overlong posts, so the next lot of these will appear tomorrow. Update: I was asked on facebook what was between the tofu on the skewers. 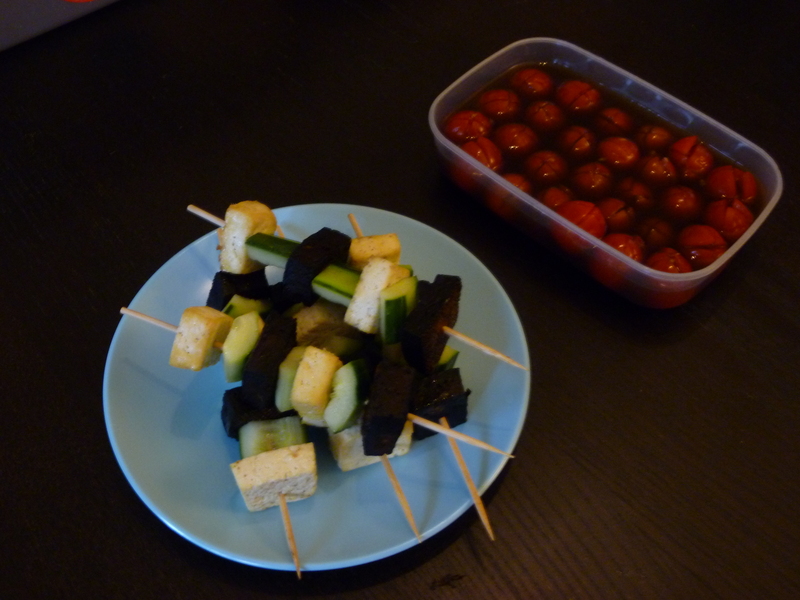 It is cucmber, that I peeled to give a stripy effect, deseeded and cut into similar-sized lumps to the tofu. Roopa used them in her original recipe. I also think cherry tomatoes would work just as well. Wow, definitely trying the Bloody Mary Tomatoes!